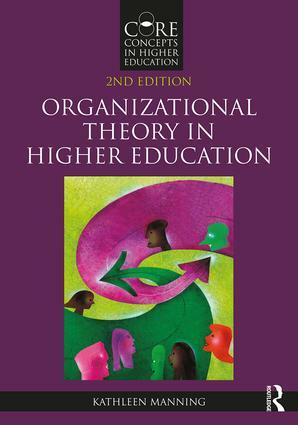 The second edition of Organizational Theory in Higher Education is a comprehensive and accessible treatment of organizational theory and higher education administration. Noted scholar Kathleen Manning offers a fresh take on the models and lenses through which higher education can be viewed by presenting a full range of organizational theories, from traditional to current. Chapters discuss the disciplinary foundation, structure, metaphor, assumptions, characteristics, and other elements of each organizational theory and conclude with cases highlighting practical applications. Questions for discussion are provided at the end of each chapter and embedded in the cases to assist the reader in making connections to their practice. Manning’s rich, interdisciplinary treatment enables readers to gain a full understanding of the perspectives that operate on a college campus and ways to adopt effective practice in the context of new and continuing tensions, contexts, and challenges. updated and enhanced questions for discussion and recommended readings.